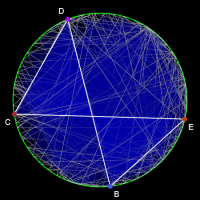 Four points are located proportionally around a circle, according to four different functions of t. A figure connecting the four points is traced through t. What are the four functions? Look at the .gx source for the answer. Tip: press "go" to animate t at a constant rate from 0 to ∏ and back, looped.